The very good series of articles on the single vocation by our new writer Salwa Bachar (here, here and here) has caused some turmoil among several readers. TIA has received heated reactions from readers who object to the commentary of St. John Chrysostom or consider marriage a higher vocation than virginity, as well as from religious persons who do not like to see lay celibacy proposed as the most needed ideal today, in view of the great apostasy we are witnessing in almost all the religious orders. Since the answers to these objections may include analyses of the conjugal act, which are inconvenient to be addressed by a single young lady, I will assume the task of responding. So far, we received about 25 different objections and I am informed that there are more to come. A nervous word-of-mouth campaign seems to be in motion spreading that TIA is against marriage, denies that marriage was instituted in Paradise, is promoting these errors and that we do not respond to the objections received. Out of consideration for our readers and a desire to clarify these topics as much as I can, I shall answer these objections in a series of articles, this being the first. For this reason, I ask patience from our present and future objectors on this topic if their points are not answered as soon as they expect. I will limit this article to a readable length. Let me state as a presupposition of these answers that, although I shall be advocating virginity, chastity and celibacy for lay people, I, as well as my companions at TIA, pay all possible respect to marriage, the formation of children and the preservation of the Catholic family. Even a cursory search on our website offers abundant proof of the great effort we have made in the last 15 years to preserve these values from the countless attacks of their enemies. I am also well-aware that natural marriage was instituted in Paradise, as Fr. Paul Sretenovic states in his articles, which I edited carefully before posting on our website (here). So, when I shall stress the nobility of virginity, chastity or the celibate life for a lay man or woman, it should not be understood as any denigration of the married life. The objections shall be answered at random. There is no particular order to them. I end this introduction apologizing to persons of delicate feelings for some crude descriptions I may be obliged to make of the conjugal act and the process of giving birth necessary to answer the many objections. 1. St. John Chrysostom affirmed: “Once man was formed, he lived in Paradise and while in that place there is no mention of marriage whatsoever. He needed a companion, so woman was given to him. But even so, matrimony still did not seem necessary. It still did not exist and they lived very happily in Paradise as if it were Heaven, without knowing marriage, rejoicing in the familiar treatment with God” (De Virginitate, part II, chap. 14). “The faithful must know that, before anything else, matrimony was instituted by God. In Genesis it is written: “And God created man to his own image: to the image of God he created him: male and female he created them. And God blessed them, saying: Increase and multiply and fill the earth” (Gen 1:27-28). Further on: ‘It is not good for man be alone; let us make him a help like unto himself’ (Gen 2:18). Further on: “But for Adam there was not found a helper like himself. Then the Lord God cast a deep sleep upon Adam; and when he was fast asleep he took one of his ribs, and filled up flesh for it. And the Lord God built the rib which he took from Adam into a woman: and brought her to Adam. And Adam said: This now is bone of my bone, and flesh of my flesh; she shall be called woman because she was taken out of man. Wherefore a man shall leave father and mother and shall cleave to his wife: and they shall be two in one flesh” Gen 2:20-24). “These words, as the Lord himself says in St. Matthew, prove that matrimony is of divine institution” (Catechism of Trent, part II, chap. VII. IV. 1). 3. 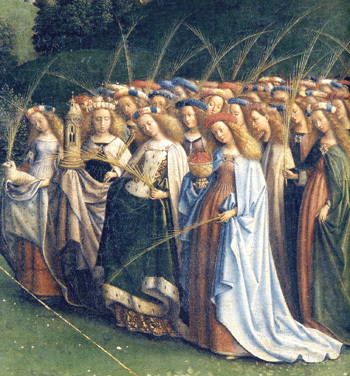 Therefore, because of the Council of Trent’s clear biblical references to marriage in Paradise before the fall, we see that St. John Chrysostom was wrong since he contradicted the narration in Genesis. 1. 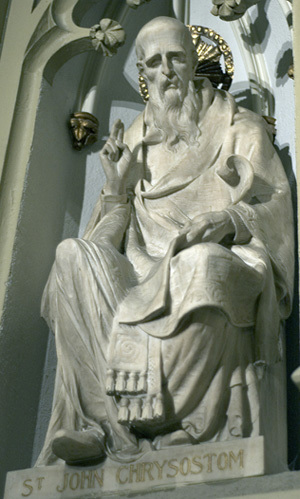 Given that St. John Chrysostom was a quite erudite man – let us not forget that he is one of the greatest Fathers of the Church, the most prominent Greek Doctor and the one who left the largest quantity of written documents – we should not suppose that he ignored those verses of Genesis and the corresponding doctrine of the Church or, even less, that he rebelled against them. I believe it would be absurd to take this position. When flagrant contradictions like this occur, we should not proclaim the Saint to be in error and tear our clothes as if it were a heresy or blasphemy, but rather look for a harmonic interpretation. 2. Knowing that the great Father and Doctor of the Church was from the Byzantine East, we also know that metaphors, symbolism, pedagogic exaggerations and other rhetorical practices are not rare in his speeches and books. Our Lord Jesus Christ himself, the Incarnate Wisdom, speaking to His Eastern audiences taught that it is easier for a camel to pass through the eye of a needle than a rich person to enter the Kingdom of Heaven (cf. Mat 19:24; Luke 18:25). Actually, those who have a strict Western mindset find it difficult to explain this metaphor; they can only conclude that Our Lord was saying that it is impossible for a rich man to enter Heaven. He was, however, friends with very rich persons, like the three siblings St. Lazarus, St. Mary Magdalene and St. Martha, who indisputably entered Heaven. So, there is something else taught in that metaphor that is different from its face-value meaning. I could cite many such examples of parables by Our Lord or by Eastern Fathers of the Church that cannot be interpreted in their literal sense. We Westerners should open ourselves to find in Eastern authors a language that is not ours. The language they employ can contradict our criteria or make us believe that those Doctors are wrong. But they are not; they are trying to teach us something else. By understanding a written sentence literally, we Western readers may be more secure in doctrine, no doubt, but we are losing more transcendent truths, beauty, poetry and the sense of the marvelous that the Eastern authors transmit. So, setting aside the preposterous suspicion that St. John Chrysostom is a heretic and TIA is following in his footsteps by quoting his text on marriage, let me try to understand what that great Doctor was teaching us. Since, I know very little of his immense work, let me raise some hypotheses about what he was trying to say when he said that marriage did not exist in Paradise. 4. It is also possible that St. John Chrysostom was following the hypothesis that the way mankind reproduced before the fall would have been different from the way it was after our First Parents sinned. We know perfectly that many theologians of great prestige, among them St. Thomas Aquinas, defended that the way God intended mankind to reproduce before the fall was exactly the same as it is after it. However, others think differently. There are not many facts or texts to support the theses about conception and birth before the fall; this is why discussion on the topic is mainly based on opinions. So far, Holy Mother Church did not lock the discussion by issuing a definitive doctrine on these topics. She allows her children to discuss them freely. What we know for sure on a closer topic is affirmed in the Catechism of the Council of Trent, published in 1566, which has unequaled doctrinal authority. It states: “It is absolutely certain that, before the sin, our first parents, were already united by true Matrimony, even though they still did not have between them any carnal relations, according to the testimony of the Holy Fathers. For this reason, the Holy Fathers affirm that Matrimony is not established by the carnal act but by consent. A doctrine, that we see frequently affirmed by St. Ambrose, in his Book On Virgins” (Catechism of Trent, part II, chap.VIII, IV). Taking advantage of this liberty given by the Church to discuss these topics and based on this Catechism, some of TIA's writers, including the author of the present answer, favor the opinion that the way of conceiving and giving birth could have been different before the fall. If St. John Chrysostom were a partisan of this opinion, this would explain his criticism of marriage as it became after our First Parents sinned. In fact, if there were a more spiritual way of conceiving and giving birth, then the consequences of the fall would be even more drastic than normally reported. This would explain his severe statements on marriage after the fall. 5. To be more specific about the way conception and birth could have been, let me set out some arguments in favor of this opinion. 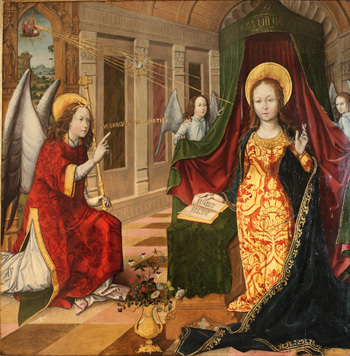 We know for certain the way Our Lady conceived the Divine Word since it is securely narrated in St. Luke (cf. 1:26-38). We celebrate her consent when we pray the Hail Mary and the Angelus daily. Her fiat has been transmitted by Tradition for more than 2,000 years. Our Lord’s conception was different from the normal way children are conceived after the fall: That is, the Angel spoke a word to her, announcing she had been chosen to be the Mother of the Messiah. She objected, reminding him that she was a virgin. The Angel replied that this would happen without breaking her virginity. She consented and, through a mysterious action of the Holy Spirit, the conception took place. Thus, this conception was made by the word of God sent through the Angel and the voluntary consent of a virgin. We have here, based on Scripture, the ideal process of conception. It shows us how the new Eve, Mary, conceived the new Adam, Jesus Christ. Now then, the question can be raised: Could this process of conceiving through the word, and not by the means used today, be considered as the normal process before original sin? Couldn’t St. John Chrysostom be comparing this way of conceiving to the present way children are conceived in marriage when he issued his criticism? It is only a hypothesis, but, I believe, a quite legitimate one. Would such a conception make him Gnostic, as some readers suggested? I don’t think that this accusation applies at all to the great Father of the Church because he never stated that matter in itself is bad, as the Gnostics state. He wrote that matter was good and pure before the fall, but became corrupted due to a moral fault. This has nothing in common with Gnostic thinking. 6. Also, the way Our Lord was born was different from the normal process of childbirth that involves pain, a punishment for man’s sin. To the woman God said: “I will multiply thy sorrows, and thy conceptions: in sorrow shalt thou bring forth children" (Gen 3:16). 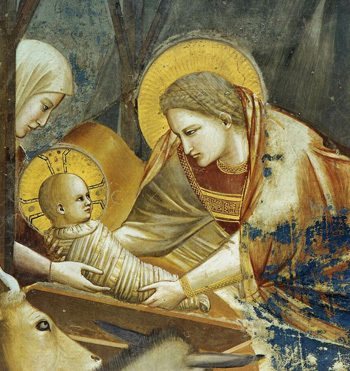 A description of the birth of Our Lord is not in Scripture or Tradition, but is recorded in a private revelation to the Ven. Maria de Agreda, a Conceptionist nun, in the 16th century. She wrote that as the birth of Our Lord approached, He wanted His Mother to see Him for the first time in His glorious state. So, he assumed the characteristics of His glorious Body and, when the moment came, He passed through the walls of her womb without causing them any damage, as He later passed through the walls of the Cenacle after His Resurrection without breaking them (cf. The Mystical City of God, vol.2, Incarnation, pp. 401-405, apud Remi Amelunxen, The Great St. Joseph, Los Angeles: TIA, 2017, pp. 45-49). Again, if the bodies were glorious in Paradise, why could children not be born like this or in some similar way? On one hand, no one knows for sure; on the other hand, it certainly does not seem to me that there is any heresy involved in upholding this hypothesis. Now, let us suppose that St. John Chrysostom had the same opinion. This would justify his severity about marriage and the loss of virginity it entailed. So far, this discussion – which I shall continue in my next article – shows that text of St. John Chrysostom should not be given a literal interpretation. Rather, it is a source that can inspire suppositions like the ones presented or many other thoughts that open our eyes to a higher reality than our day-to-day life. St. John Chrysostom is not wrong; using pedagogic exaggeration he sings the glory of virginity. It is not rare to find similar exaggerations in Eastern texts, including those of Our Lord Jesus Christ. Now, I need to adjourn the continuation of this and other answers to my next article.